The Padharia (or Padhar) are a community (people group) of Gujarat. They are a Scheduled Tribe in this state. The caste name identifies them as those who eat the root of a certain plant. The majority are landless agricultural laborers, and some are commercial fishermen and trappers. They are divided into several clans, and marriages occur across clans. 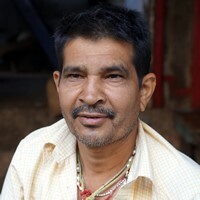 Each clan has its own leader, or headman, and each village has a "patel", who resolves disputes at the village level. They are Hindus. There is almost always spiritual opposition and opposition from men to the Gospel, but the Lord can overcome all opposition as people trust him. Please pray for the Padharia who are self-professing Christians to gain a vision for reaching all of their own people group with the good news about Jesus Christ. Pray they will communicate the Gospel message clearly and accurately, not mixing it with teachings or concepts from their earlier religion. A few of the Padharia people have identified themselves as Christians to the Indian census, which is quite encouraging. Please pray these Christians will understand their need to make a personal commitment to Jesus Christ, inviting him to enter their lives and forgive them of their sins. Pray they will be willing to become obedient disciples of Jesus. Pray for all in the Padharia community to hunger to find a savior, one who can forgive their sins, offer them assurance of eternal life, and love them. This is very different than what the gods of Hinduism offer. View Padharia in all countries.